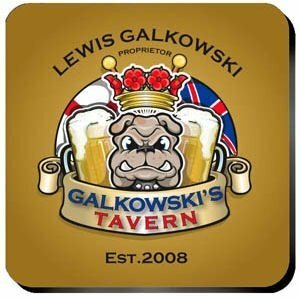 An English Pub style tavern needs to have some cool coasters and these ones certainly fit the bill. The set of four full-color coasters has a cork backing for extra protection of the bar or furniture in the family room. Coasters are customized with a first and last name plus the tavern establishment date. A mahogany caddy is included for easy storage when not in use at the tavern.